Looking for a New BMW i3 in your area? CarGurus has 371 nationwide BMW i3 dealers with 5,962 new car listings. 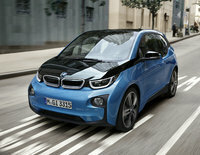 BMW launched its diminutive i3 in 2014, as the entry point for its “i” series of premium electric vehicles. The five-door hatchback has seen improvements over the years. For 2018, the i3 gets a facelift and updated features. Buyers often notice the quirky styling of the BMW i3. Entering its fifth model year, the i3 continues to make a statement. The two-tone paint scheme, short hood, and non-linear window line are unlike other BMWs; the twin-kidney grille is the sole family resemblance carried by the i3. For 2018, BMW made LED headlights standard on the i3. Front and rear bumpers, wheel designs, and additional colors (Melbourne Red Metallic and Imperial Blue Metallic) are new as well. The interior style echoes the ultramodern exterior, full of thin, planar surfaces and interesting blends of textiles, wood, and plastic—over 80 percent of them recycled or renewable. Like some trucks, the i3 has reverse-hinged rear doors, allowing an unobstructed view. The dashboard stretches across the cabin to create an airy feel. Trim level changes the overall theme considerably. Mega World, Giga World and Tera World trims are carried over from 2017; the only change for 2018 is a new cloth-and-leather upholstery combination for the Giga World package. The base i3 gets a single electric motor mounted at the rear—making the vehicle rear-wheel drive—that develops 170 horsepower and 184 pound-feet of torque. Benefitting from a larger 33 kWh battery introduced in 2017, there’s 124 miles of driving range, and the sprint from 0-60 mph takes 7.2 seconds. For better performance, choose the new-for-2018 BMW i3s. The i3s benefits from unique exterior theming, lowered suspension, a wider wheel track, a SPORT driving mode, and an electric motor that’s uprated to 181 hp and 199 lb.-ft. of torque. Total range figures for the i3s were unavailable at the time of this writing, but this performance variant hits 60 mph in just 6.8 seconds. All i3 models take about 4.8 hours to charge fully on a Level 2 charger; although, a DC 50kW fast charger can get the battery up to 80 percent in as little as 45 minutes. 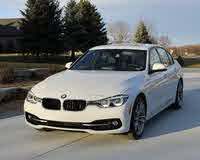 Should drivers develop range anxiety, BMW offers a 2-cylinder, 2.3-gallon range extender engine on both trims. This provides up to 205 miles of total driving range on the regular i3, but the additional weight can cause performance to suffer. One advantage to driving the i3 is a wide array of technology options. BMW’s iDrive 6, the latest evolution of automaker’s infotainment system, arrives for 2018 with better voice recognition software, over-the-air update capabilities, Apple CarPlay, and a touchscreen interface that feels familiar to smartphone users. 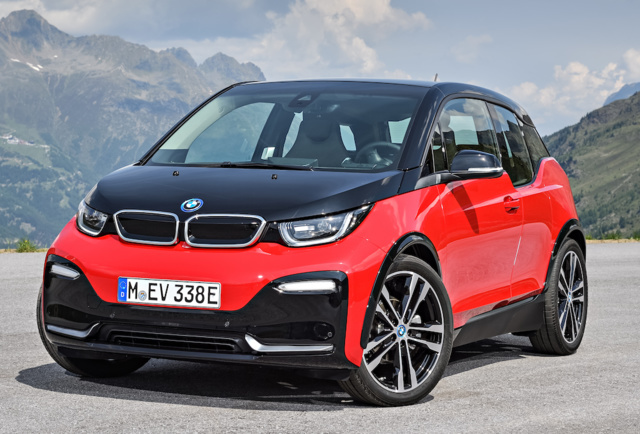 BMW also equips the i3 with its Connected or Connected+ services, which include functions designed for the i3, like intelligent route planning, a function that takes into account the available range and charging station locations when determining an ideal course. The i3 has driver and passenger frontal airbags and side curtain airbags. The i3 also gets a suite of optional driving aids, like active cruise control with a low-speed function, parking sensors, a parking assistant, pedestrian detection, and frontal collision warning with automatic emergency braking. The i3 was evaluated by the Insurance Institute for Highway Safety (IIHS) and scored a Good rating, the highest score, in most categories. The i3 isn’t for everyone. The low range of the electric car means that long trips need to be well planned. Even with the range extender, there’s less than 200 miles between stops, and in range-extender mode, the vehicle struggles to keep up to highway speeds. For car buyers in cities, the tight packaging and small wheelbase make for tidy parking and easy maneuverability. The i3 also qualifies for the full $7,500 federal EV tax credit. With those attributes, singular exterior, and high-tech drivetrain, the i3 is a compelling option. What's your take on the 2018 BMW i3? Chuxter Good article, except when in REX mode, it does not "struggle to keep up to highway speeds". Also the "reverse-hinged rear doors" don't allow an unobstructed view; they allow unobstructed access to the rear seats. Might be good to actually drive the cars you review? Have you driven a 2018 BMW i3? Enter your zip to see incentives for a new i3 in your area. Looking for a Used i3 in your area? CarGurus has 1,721 nationwide i3 listings starting at $10,900.